“I am an ancient one, step onto my path, I have come to honour you with the change and movement in life that is necessary in this now moment. Hear now my voice of potential, endless and infinite, the universe lives in you. You, through me, have become like a ray of light, filled with the integrity and power of spirit. Allow your trust in self to guide every step embracing all change as transition and rebirth. In my Sacred Light, let a new future be born in your every Breath. Zircon in Healing: “Of the many stones on Earth, Zircon is mentioned in more religious texts than any other, it is truly one of the ancients, Zircon comes in all colors from red to blue, most however, are gold, clear, yellow or a combination of those. It is interesting to note that although this is the most talked about mineral in ancient texts, it is rarely found in crystal shops, this is not due to its rarity, but quite the contrary, Zircon of varying grades is found nearly everywhere and therefore not worth selling. Zircon makes up many of the world’s beaches and river beds, the most famous of which would be the Ganges in India (The River of Change). It is also worth noting that this mineral is melted down to form computer chips, so although you may not have it at home as a recognized crystal, there is a good chance she has affected you today. Zircon is the crystal of “Life Changes”, a fact that it not only offers to us via its role with computers, but also in its healing ability. 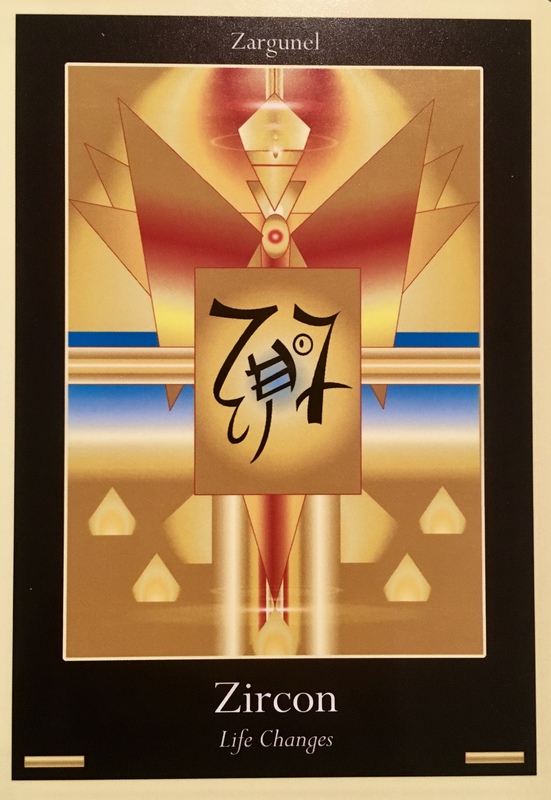 Zircon activates a Trust in Self at the seed of its work, which blossoms into an embrace of change without fear; the past is forgiven and released, opening all the potential paths forward. The mind is then cleansed and the many parts of the self unite to become one with the single goal, to grow through change with acceptance. It is thus easy to see, Zircon is a great stone for those who, due to past failures, have given up on themselves and area trapped in the past. As a spiritual development stone, Zircon increases the intuition and sheds light upon the areas of self still to be explored, so the journey of life can continue and the path to higher enlightenment is discovered. It is one of few stones able to link directly into one’s genetic level, able to facilitate necessary changes for evolution. This fact was misused in Atlantian times and today is accelerating our race’s growth through computers. Zircon has always been seen as a visual translation stone between Spirit, Man and the Earth, able to bring clarity to messages received from all levels. It is a sacred stone of Osiris, a relationship that stems from its role in the genetic creation of the Osirian and Isirian principles in Atlantis. Your Healing Journey Today: “If Zircon has come to you today change is at your doorstep. The changes that are usually presented by Zircon are ones that have been long-awaited, they are always life altering experiences from which one grows both inwardly and outwardly in the world. the most exciting thing about Zircon presenting for most people is that it usually represents the last part of life change, the part after the pain, tears and attachments have been realized, meaning real change and Now. Zircon is also a great communication stone and will bring focus, determination and forgiveness to the party, through this it lets us see that change is not just about cutting away; it is about formation, realization and Growth. One thing is for sure, with Zircon present, things are about to be very different. Well it’s not surprising that we are still accepting that things are changing in a big way. Floods and fires and superstorms. The elements raging out of control. Ramping up. The weather is as unpredictable as the human race. It’s easy to feel like our lives are out of control if we are in the midst of a tumultuous change. We can feel as if we are attempting to swim upstream in a raging river. Or maybe all we think we must do to survive this is hang on tight. But maybe this is still somehow about letting go. Somehow about priorities, about pulling together, being of service. Now more than ever we have the chance to band together and make a difference. We can heal, we can help, we can give what we have. We can share our gifts with no agenda. Just because people are suffering and they need us. Just because we are waking up to realize that we are all One. People out there, people just like us have lost everything and must start new. People have lost their homes and possessions that were exactly as important to them as our homes and possessions are to us. Whatever we have to give, we must give to help them rebuild. Time, money, prayers, love, space in our hearts. Refocusing on building something new. Stronger. Better. Broader. A bigger picture.